My study of herbalism began around 4 years ago after a trip to The Herb Shoppe, a local herbal apothecary. Intrigued by the herbs, plant medicines and energy of the shop I felt there was a deeper significance for my visit. It turned out there was. Within a month of my initial journey to the shop, I had enrolled in their 12 week internship program and began to immerse myself in the herbs. This immersion inspired me to further my herbal studies and understand the healing abilities of plants. Presently known as The Herb Shoppe Pharmacy, the essence of the original location remains with it's supply of organic herbs, potent herbal preparations, classes and access to holistic practitioners. Located on the contemporary street of Mississippi Avenue in Portland Oregon, owner Amanda Furbee and her knowledgable staff offer plant based modalities of healing to the Boise-Elliot neighborhood. Amanda grew up in the desert surrounded by plants like Chaparral, Devils Claw and Ocotillo but it wasn't until she became an adult did she understand the significance of these plants. From a young age she was disheartened by the over use of prescription medications and allopathic approaches to health. She moved to Portland in 2010 and soon after began to work at The Herb Shoppe. The first all organic herbal supplier in town, The Herb Shoppe was founded by naturopath JJ Pursell in 2005. Amanda worked along side Dr. JJ and learned about medicinal herbs, how to prepare them into medicine, and the skills to run a successful herbal business. Amanda saw great potential in the shop and knew she could help it grow and expand. She enrolled herself in business courses and completed Rosemary Gladstar's Herbal Certification course. In 2014 Amanda and JJ opened The Herb Shoppe Pharmacy on Mississippi Ave. The Pharmacy became the main production facility of the medicine for all of their locations. The shop was a lovely addition to the Mississippi district providing the community with high quality herbs and herbal medicine, classes and access to holistic practitioners. In 2016, JJ sold her portion of the business to Amanda giving her the opportunity to mold the shop into what it is today. From Agrimony to Yohimbe Bark the shop supplies customers with a diverse selection of high quality, organic whole and powdered medicinal herbs. Organic culinary herbs, spice blends and specialty salts are also available. 24 custom herbal teas plus a rotating Tea of the Month are blended by hand and available by the ounce. Soul Shine, a tea for adrenal and immune support along with their Respiratory Relief tea are two of their most popular blends. Brewed tea by the cup can also be purchased and enjoyed while you shop. Kombucha is available on tap courtesy of Eva's Herbucha, it can be purchased by the glass or you can bring your own vessel for larger quantities. Supplies to make herbal salves, infused oils, herbal capsules and household cleaning products are available for DIY enthusiasts. Crystals, smudge sticks and candles are also for sale and bring a touch of magic along with them. 70-75% of the products sold at the shop are made in-house and exclusive to The Herb Shoppe. Their expansive line of tinctures, infused oils, salves, elixirs, and skin care is a collaborative effort between Amanda and her employees. 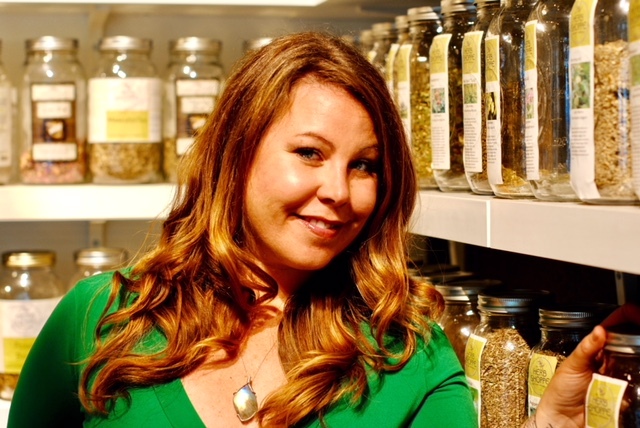 "We have worked very hard to refine and make changes to the entire Herb Shoppe product line" said Amanda. They strive to create palatable medicines that appease the flavor profiles of many, especially those new to using herbal medicines. One of my favorite features of the shop is their Blending Bar. Custom tinctures and essential oil blends can be created right before your eyes. Have a prescription for a tincture? The Herb Shop can mix and fill it for you in 1 & 2 oz sizes. Herbal consultations, massage, and energy work are a few of the holistic services offered at the shop by Amanda and other practitioners. On Saturdays Natropathic Dr. Ose Okojie is available to see patients from 2pm-6pm. Unlike the "quick-fix" of prescription drugs, plants and herbs gently nourish and heal a person while improving their overall health. Before treatment your practitioner will address your health concerns, discuss a realistic time line of healing and the steps needed to achieve your goals. Although I have never been a patient at The Herb Shoppe I appreciate the holistic services they provide. An abundance of classes are offered at the shop to educate and inspire the masses. Local herbalists and others from around the country have taught classes on facial diagnosis, healing trauma naturally and cooking with herbs in the shop's classroom. Guided herbal meditation classes hosted at the shop have become increasingly popular. These meditations focus on breath work and the healing qualities of a specific herb. A 12 week internship program offered at the shop can help cultivate a stronger relationship with herbs and plant medicine. The internship is an opportunity for aspiring herbalists to deepen their understanding of herbs through hands on experience and customer interaction. My time as an intern at The Herb Shoppe was fulfilling and life changing. It allowed me to discover a passion for the plants and herbal medicine I never knew I had. Once a month Amanda is featured on local news channel KGW to share how to make an herbal remedy. Lib balm, toothpowder and Elderberry syrup are a few of the items she has demonstrated. When asked how she blends her love for the plants with the responsibilities of running a business she had this to say. "It's an ebb n flow flow. 90% of the time you're a business owner and 10 % of the time you're an herbalist. Even though your heart and soul may be 90% herbalist and 10% business owner, in order to be successful in the beginning it must be the other way around." Amanda's entrepreneurial spirit along with her love for the plants makes the The Herb Shoppe Pharmacy a wonderful resource for herbal supplies, services and education. Trips to a local market or retail shop rarely inspire us to change our life path. 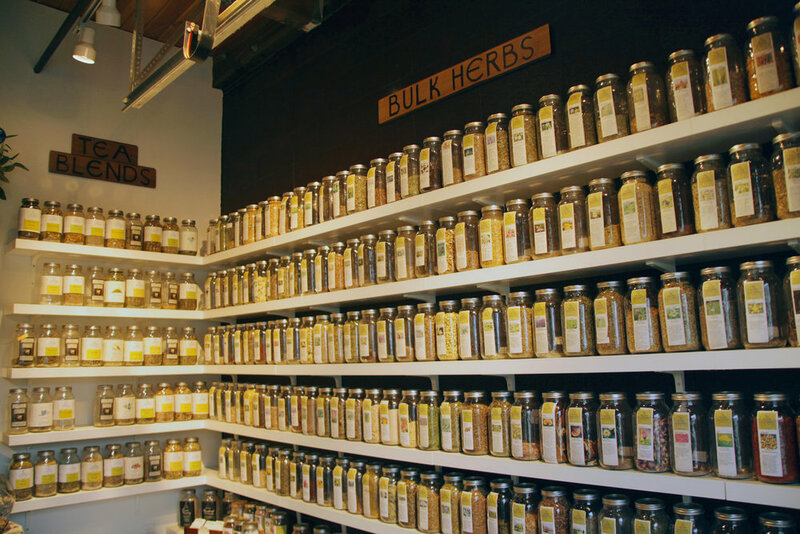 The Herb Shoppe served as a catalyst for me to pursue the study of herbalism which changed my life for the better. Community oriented and collaboratively run The Herb Shoppe Pharmacy is one of Portland's premiere herbal apothecaries. For a listing of products, up coming classes or to schedule an appointment for one of their many services head to www.theherbshoppepdx.com. To read the first review of this series, click here!